President Muhammadu Buhari is currently meeting the national leader of the All Progressives Congress, Bola Tinubu. 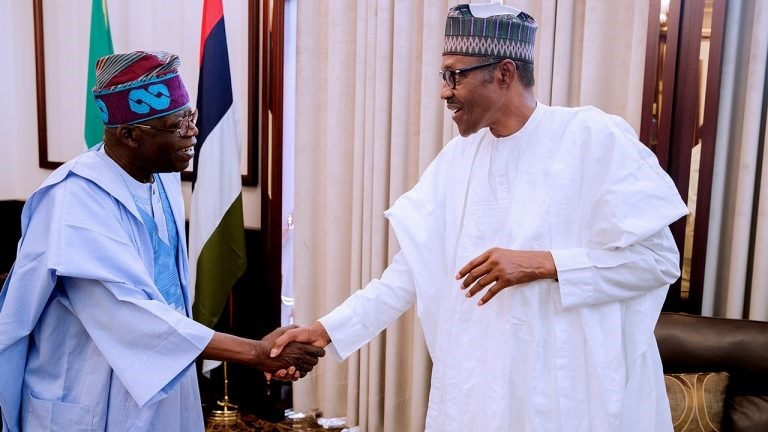 National leader of the All Progressives Congress (APC), Bola Tinubu is currently meeting with President Muhammadu Buhari in Presidential Villa, Abuja. Tinubu who arrived the State House Villa, Abuja around 3.50pm walked straight into the office of the President for a closed- door meeting. The former governor arrived the President’s office minutes after the Governor of Borno State, Kashim Shettima and a delegation from Borno left the Villa. The President’s meeting with Tinubu is coming at a time some governors who are of the APC are calling for the sack of the party’s National Chairman, Comrade Adams Oshiomhole over the just concluded primaries of the party. Yesterday, some aggrieved members of the party dined with the President at the Villa where issues relating to the primaries were discussed.